Today, I went for my lap swim and then after lunch I spent a few hours helping out a friend who is getting ready for a yard sale. She is moving from a rather large house to an apartment.A couple of my friends, Anne and Fern spent the whole day and boy did they work cleaning out the garage. I spent my time in a bedroom going through linens and pricing boxes of assorted things. 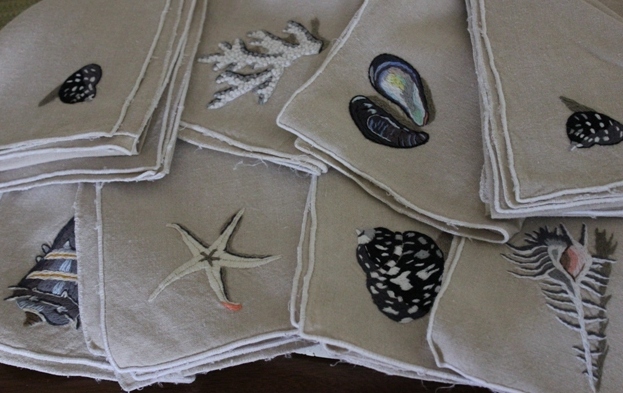 I brought home this set of linen place mats and napkins. I don't use this type of thing, but they were so pretty, I thought they could be made into something-- a table cloth, a runner, cushions, who knows. Aren't they pretty? Tomorrow, I'm hoping to get my things organized to take to our craft shop down town. Oh, and by the way, I figured out my matching points problem on the blocks from yesterday's post. When the seams are ironed flat, they go together perfectly. Unfortunately, I'm on the last row. Now I have to join all the rows together, but I can't open the seams. I will have to iron really well and struggle with it. 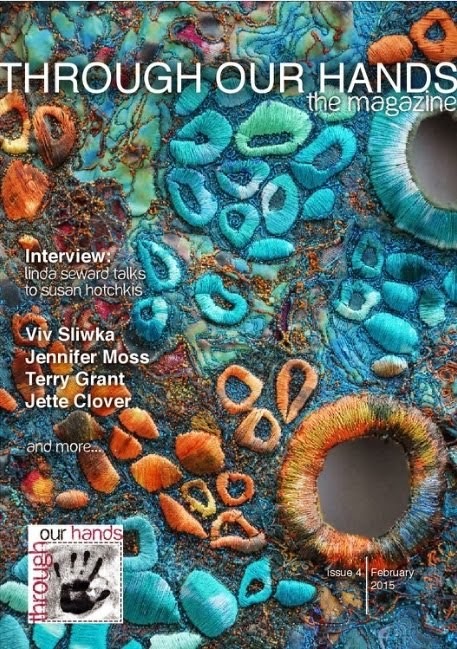 I really miss my art quilting! 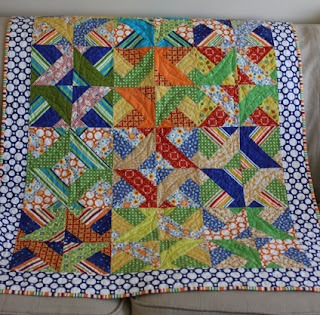 I pledged this week that I would finish putting together a quilt that I'm doing as a gift, so I could get it ready to send out for professional long arm quilting. It's a bit of a problem for my blogging because I don't want the recipient to see it and I'm spending all my time on it! Well, I'm having such trouble putting it together, I've decided to show one block and vent! While I'm no expert quilter, I have made many quilts, but this one is defeating me. You can see that it's a shoo fly block in which I've changed the colors. I don't really know what it is called-- may have heard it called Lifesaver. I have ironed the seams as opposing seams, but I'm having a terrible time to get the points of the half square triangles to match nicely. I've trimmed it, ironed it, pinned it, carefully and still end up ripping out several times. I have one more horizontal row to put together and then I must put the rows together which could be even worse. I'm going nuts!Any suggestions? Sometimes the most miserable of nights can turn into the best of days. I had a pounding high blood pressure headache again last night that I suffered with until I finally took a half of my blood pressure medication. After consulting with the pharmacist this morning, I'm going to adjust my medication so it should be better at night. Since I didn't officially retire, but rather I left due to illness, I have this feeling that I need to account for every minute of my day. After a night like last night I gave myself permission to relax today and it has been quite a lovely day once I got myself awake. I met 2 friends for tea, did one quick errand and came home. I already decided that this week I would devote to finishing up some things because I'm taking my art to Chal Baie, our local craft shop on Friday. 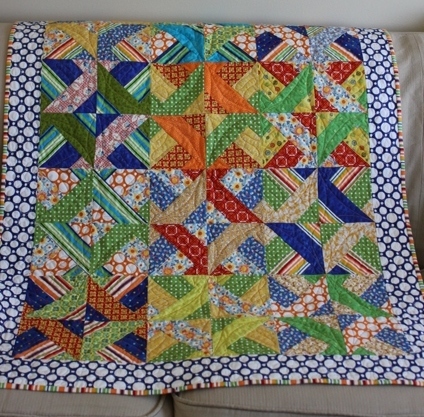 The first thing I did was to finish the little tiny bit (it took about 10 minutes but was sitting for months) of machine quilting in this baby quilt. Finally, done! Then I added elastic to a pair of pants that were too loose. After lunch I tried a new recipe for rhubarb chutney which I will have for supper with lentil loaf. I got my sheets in off the line; I will have a fresh bed to-night. I've been walking around the yard taking photos of the latest blooms. 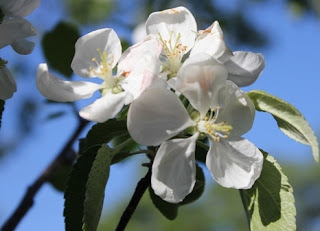 The apple tree was in full bloom last week. 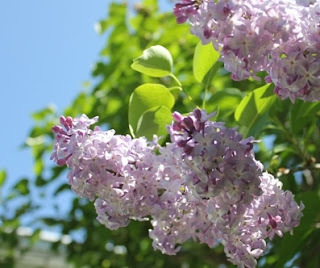 Today the lilac is at it's best. They are just outside my studio window. If I could smell, I'm sure it would be wonderful! 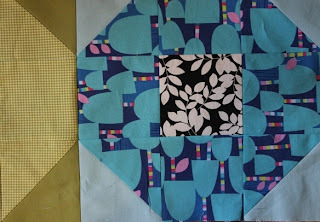 The next thing on my agenda for the week will be to finish putting together a quilt which I am doing as a gift, so I cannot picture it. Sorry, it won't be a very artful week for blogging! I'm off to make a cup of tea. We've been having the most beautiful warm and sunny weather that I have no choice but to be outside. I potted up a few plants including these two gazania's for my back deck. It is a southern exposure with no shade and these love the hot sunny locals. 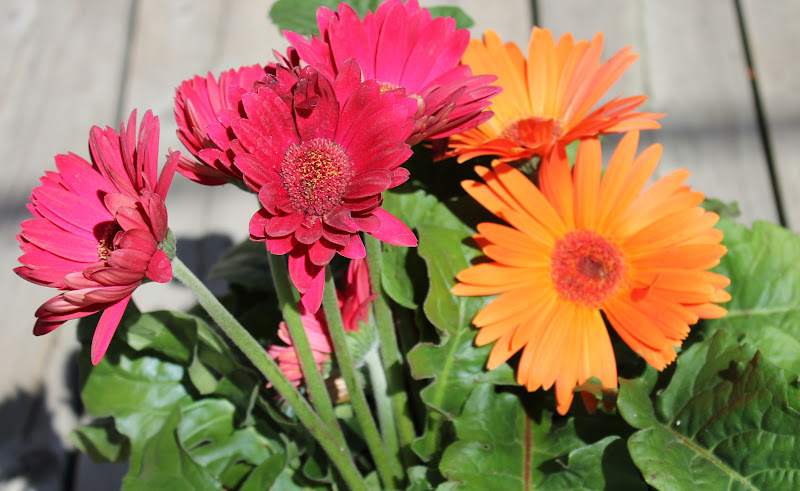 I love the bright pink and orange combo, I seem to be using it everywhere I can. I did a little bit of weeding and mulching at my front walk. One thing i do is limit any one task so that I won't be up all night in pain. 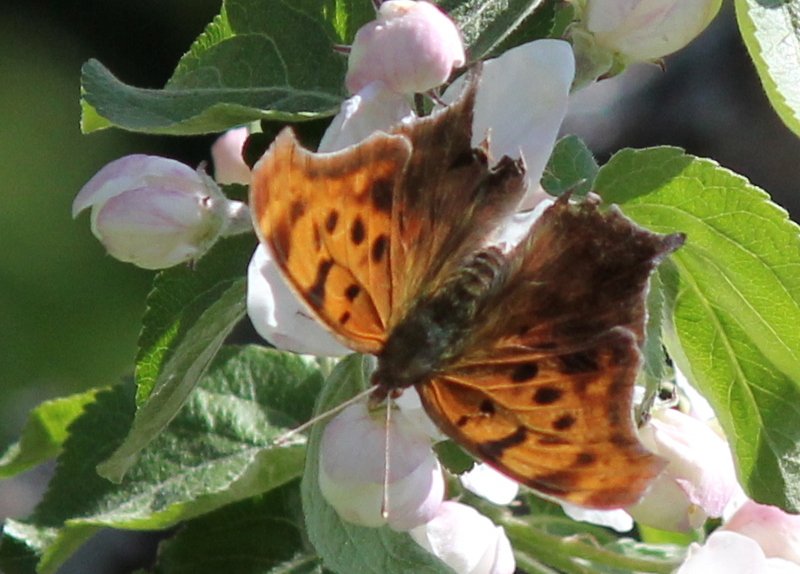 Yesterday, after I had taken the bird photos, these butterflies moved into the apple tree. I'd like to get a butterfly reference book so I can find out what they are. 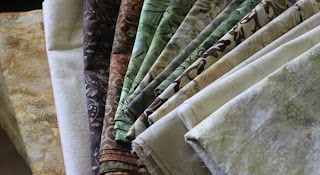 I'm looking forward to some rainy weather so I can sew again! 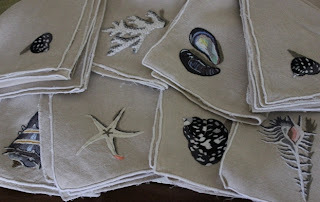 I'll get to sew all day on Saturday at our last guild UFO day.. 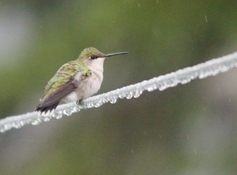 I know the hummingbirds are back because the syrup in the feeder has been going down, my husband has seen them and I've heard one buzzing by my ear. Today, was the first time I've seen one though, and I can see I'm going to have fun with my new camera this summer. I took this photo from about 12 feet away; just wait until they get used to us and come closer! Those are water droplets on the line. 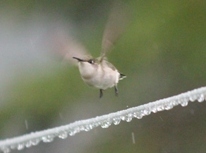 While it is not a fantastic photo, it still amazes me that I could catch it in flight. 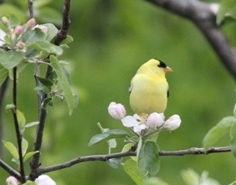 I also just discovered after all these years that the goldfinches like to eat the apple blossoms. I've seen the cedar waxwings do it; they visit us for the apple blossom time and disappear after that. After lunch with Gord, I finally came into my sewing room and got back to some fun on my runner. 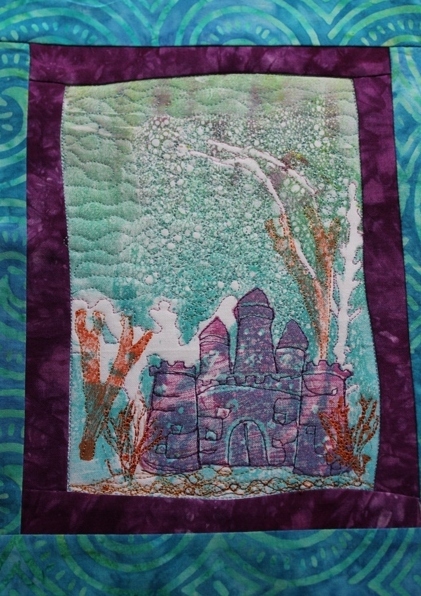 I've almost finished the quilting. It's been a good exercise for me to do something that stretches me some. I'm not quite comfortable yet. I've been doing free motion for some time, but I've always stayed within comfortable meandering designs. 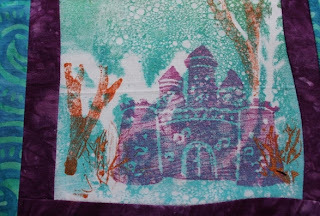 Also, I'm very relaxed about doing thread painting on my gel prints. I added the lighter green to each end of the runner. 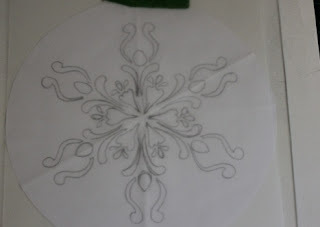 To quilt it, I sort of freely followed the design from the stencil, meaning that I didn't trace it, so now I have to copy it somewhat for the other end. 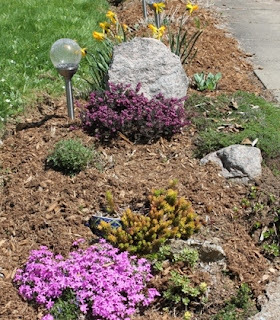 I used a meander with a 3 petal flower for the border and I even tried my hand at couching one of the lovely trims that Leslie sent me. Today it is our 32nd wedding anniversary. I can hardly believe it! It feels like we've been married both forever and for no time at all. Isn't that the funny paradox of time? We're going out for a quiet dinner and maybe a walk downtown since the sun has come out. Our gift to ourselves this year are some golf clubs which we have on order. 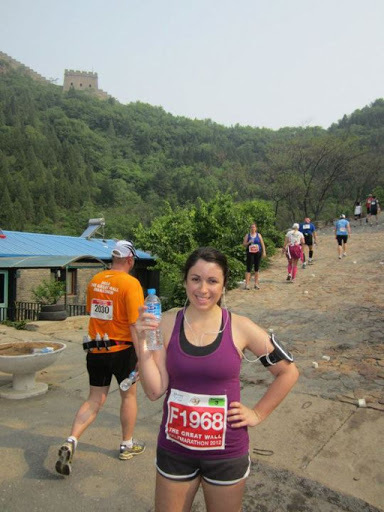 I wrote on the weekend about my daughter's half marathon on the Great Wall of China. If you'd like to read about it from her perspective, check out the blog on my sidebar called My Adventures in Korea. What started out as not such a great day has turned into quite a lovely one. Isn't that often the way? We have had another couple of unseasonably warm days, record breaking even, and I'm not fond of the heat. Yesterday, I did a bit of gardening and retreated to the indoors. However, my air conditioner is not in yet, and between that and an aching knee, likely from the gardening, I didn't get much sleep. 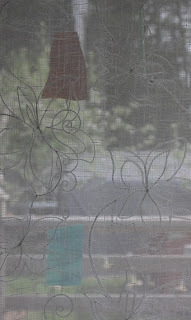 I've been missing my sewing machine and am waiting for some rain to get back to it. However, when I settle down for a bit of TV time before bed, I've been knitting a second baby afghan, more boy's colors this time, not for anyone special (yet), just because they're fun to knit! After the long weekend, I had a couple of errands to do this morning and then I made lunch for my husband and I. When he works in town, he sometimes comes home for lunch which is quite nice for both of us. I relaxed and took some time to enjoy myself despite the heat. One thing I do like about the summer is changing the heavier curtains for some more summery shears. I love their misty effect and the way they sway in the breeze with the open windows. 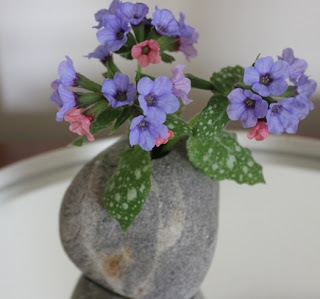 I don't need a big bouquet to stir my soul, even the tiniest of sprigs from my yard can provide days of enjoyment..
And then to make the day even better, the mailman brought me a package from Leslie of MarveLes Art Studios. I could not have been more amazed at what she had taken the time to put together for me. You know how sometimes you're a little down and it happens that something comes to you just when it is needed? Well here it is. And look at the colors of this fiber. It matches my runner perfectly! 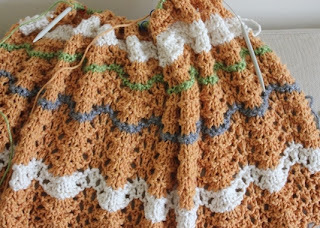 I'm linking to WIP Wednesday at the Needle and Thread Network. It has been sunny and warm this weekend so we are filling our time with outdoor chores. Yesterday we went golfing; today my husband is cleaning the deck. I will be planting some seeds. My daughter, who is teaching in Korea, has also been busy this weekend. She ran the Great Wall Half Marathon. 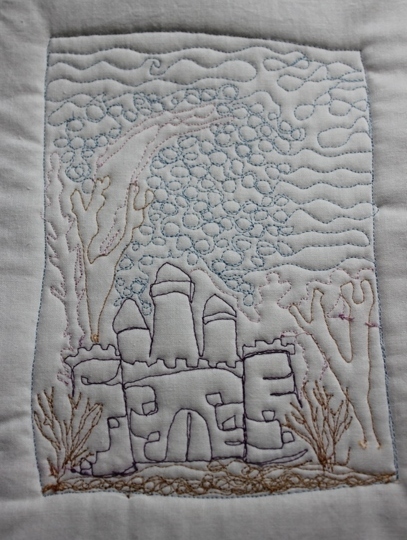 Rain is forecast for tomorrow, so I should get back to my sewing machine. 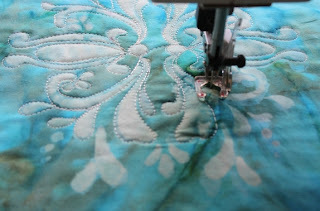 I managed to get the runner sandwiched and started the free motion quilting. 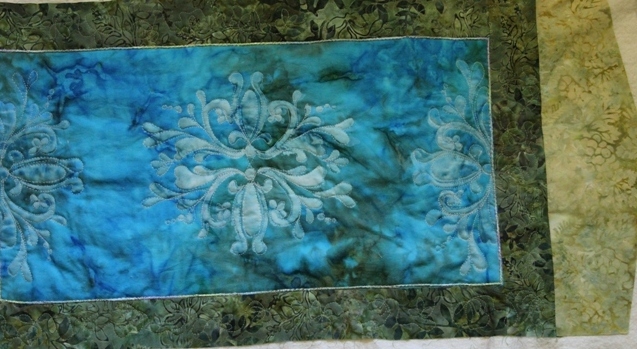 I'm anxious to try some of the new threads but I think this piece calls for simple quilting. I'd like to sit down to it now, but a friend just delivered a bucket of hand picked fiddle-heads. Since I'll be on the go most of this long weekend, I'd better get them blanched and frozen. 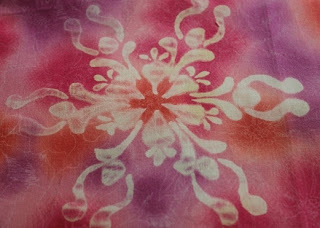 You might like to see some batiks I've been collecting for my next quilt that I'll be making for my sister in law. The colors match swatches from her curtains and bed spread, and while they're currently not my colors, I think they're very pretty in batik. My daughter is currently in China, having flown there last night from Korea. She will be doing the Great Wall of China marathon. She sent us a page where we can put in her number and track her in the race. It starts at 8PM our time to-night. We won't see pictures until she gets back to Korea since they don't allow Facebook there. I think it's just amazing that we can track her progress from here. Finally, to all the Canadian readers, have a great long weekend! 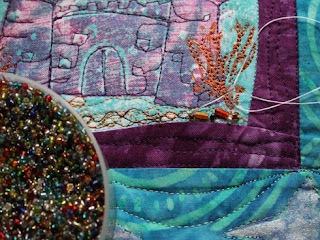 I decided I was going to get that crease out of the interfacing in my castle piece, and so I wet it to give it a good press. 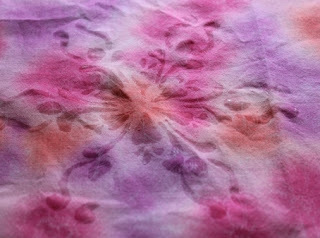 Right away the plum hand dye started to run. I dried it quickly by ironing, hoping to stop the run but the purple dye shows now on the turquoise border. The good news is that I got the crease out! Always one to take advantage of a mistake, I pondered doing something as a cover up, but nothing I can think of fits the design. Next week, I believe I will cut the border off and add new ones in the quilt as you go method. I will be much happier. This morning started out damp and rainy looking but the skies cleared by noon time. 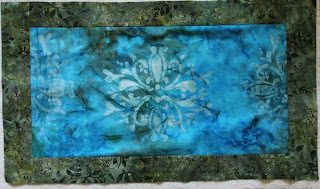 I hung out a wash with some fabrics that were delivered to my door early this morning. I was still in bed when the doorbell rang! 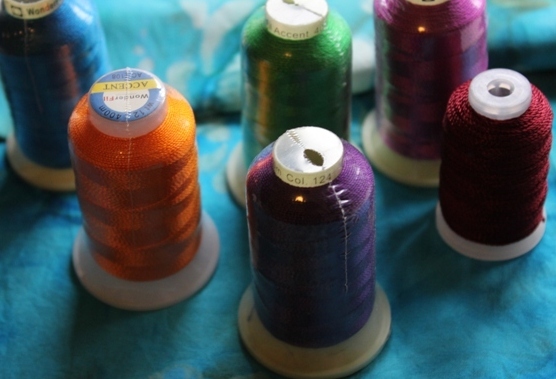 Besides some batiks that I ordered, there were also these threads which I hope to use for machine quilting. The red on the left is YLI which a friend picked up for me. The other 5 spools are Wonderfil which came in my fabric order from Patsy Thompson Designs along with her book called Hyperquilting. 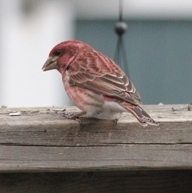 Also, today, I had a new little friend visiting, the purple finch. I should probably have been doing some gardening, but I went for a walk and picked these forget me nots on the way home. 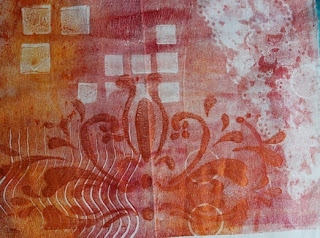 I had time only to add borders to this small runner. Perhaps I'm crazy to use it as a practice piece, but I want to try out some machine quilting designs with the new thread. 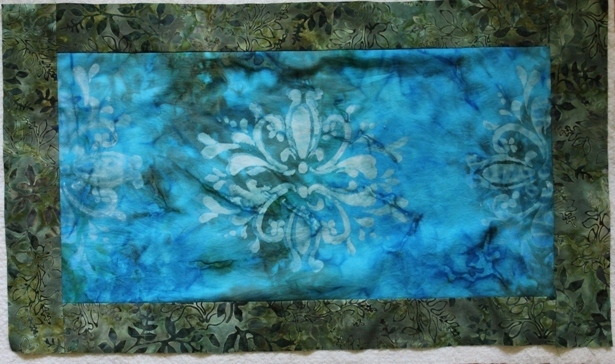 I love the colors though, so if it's not good enough to sell, I might like it for my own table. 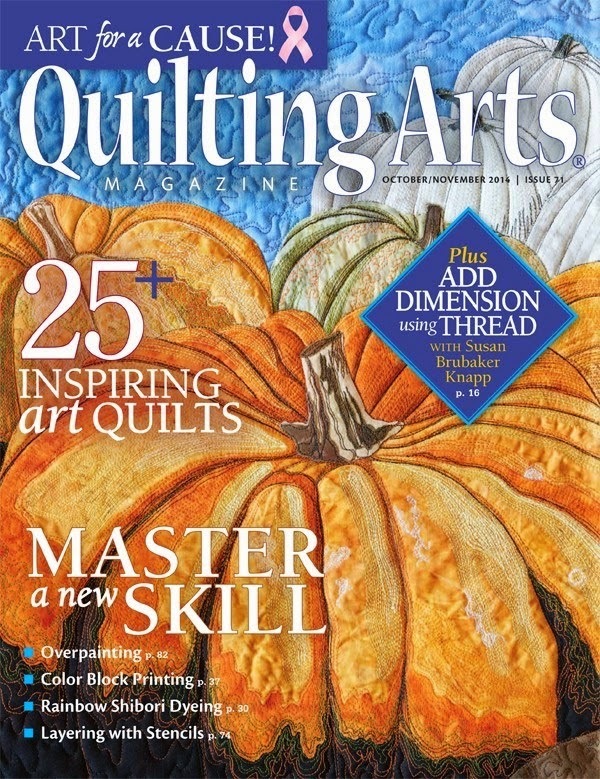 Now I'm going to make some tea and read about machine quilting to see what I should dare to try out on my runner. Oh how I love to sit here in my studio with the window open listening to the birds! A soft rain started about a half hour ago as well. This week, I've been photographing the birds like crazy. 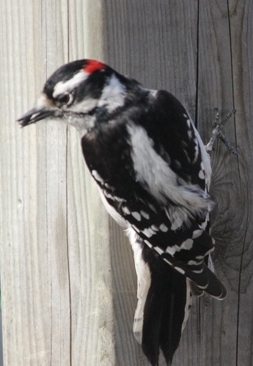 Here is one of a pair of woodpeckers that likes to visit. 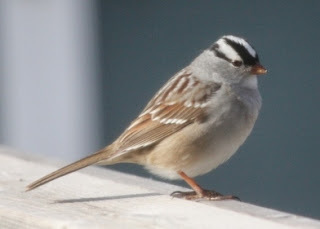 We've had these white crowned sparrows here lately. They're not a common bird here. I was out of town yesterday and so was quite happy to get back to my castle today. 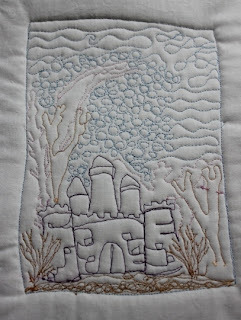 I finished the machine quilting when I ran into a little wrinkle-- yes literally. Why do these things happen on one's favorite pieces? If you look to the left and right about halfway the fabric is wrinkled. 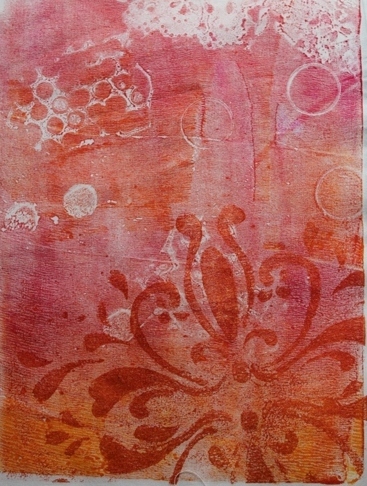 I ironed everything and spray basted before I started and all seemed smooth. I think the crease may have been in the interfacing underneath. I have tried ironing but there still seems to be a bit left. I'm going to leave it for now; I may have to take out the one side and redo it. You can see that I've added 3 star fish at the bottom. 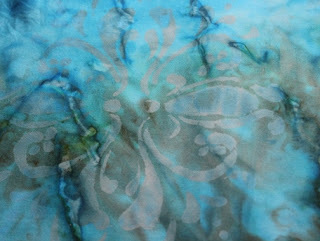 I started with Neo Color II crayons which weren't intense enough so I did them over with Setacolor fabric paint. And I was so excited to be done, so I could start the beading and embellishing. 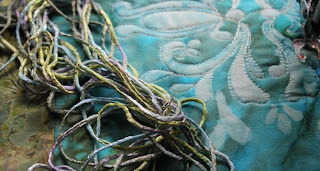 I'm linking to the Needle and Thread Network today. There is lots of quilting and needlework to look at there. This morning, I made a quick market run to pick up the Mother's Day lobster. 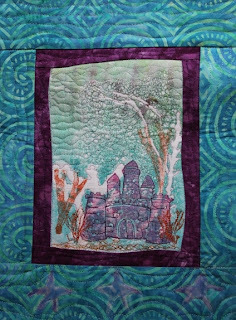 hen, I got my walk in despite the intermittent rain, and once I'd eaten lunch, I got set up to do the free motion quilting on my castle. The first thing I did was to get a couple of pieces of dried seaweed out of the old telephone book where I press them. 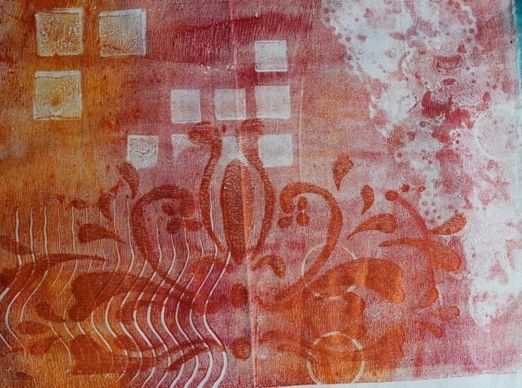 Using Setacolor opaque fabric paints, I printed a bit of ornage/bronze colored seaweed in the forefront. It's supposed to cure overnight but I couldn't wait! 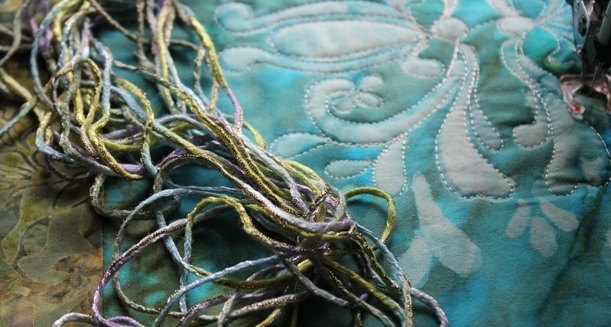 It was too cold to open my windows today to lsiten to the birds, so I spent my time while sewing imagining what the seahorses and sea nymphs (is there such a thing?) would spend their time doing in their watery realm. 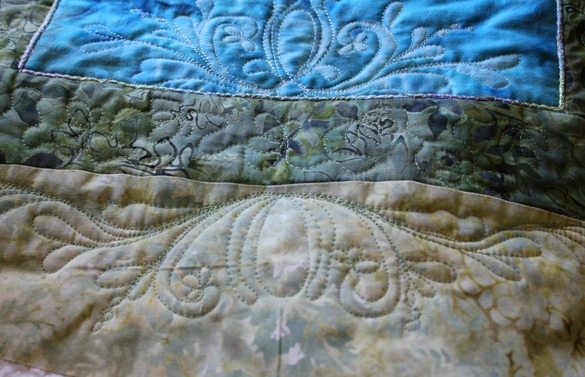 What really gets me excited is getting the quilting/thread sketching done. I realized after changing colors every few minutes, that next time I should sandwich 2 little pieces with the same theme, then I could do one color on each piece before I would have to change it. It's always fun to flip it over and check out the back. Finally, it is warm enough to open the window in my studio and listen to the birdsong. 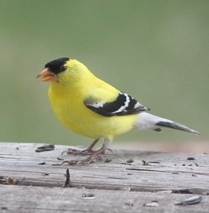 Today, through my window, I have seen and heard chickadees, white crowned sparrows, song sparrows, 2 woodpeckers, many goldfinches and a dove. Can you guess then how I chose my blog name? I love to be outside but when I'm inside, I spend a lot of time looking out. I am happiest when I can be in the outdoors and blissful when I can listen to the music! 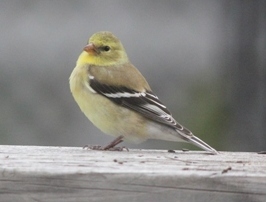 The gold finches are a plenty right now and love to visit the feeders. In winter they both have the same coloring,but in spring the male develops his wonderful color to attract a female. I've been wishing to get back to some sewing, so I quickly did my errands and lunch with my friends. I even left the cafe first in anticipation. I have many pieces to choose from for stitching but decided this little one with the ca, and I like to take handwork with me. 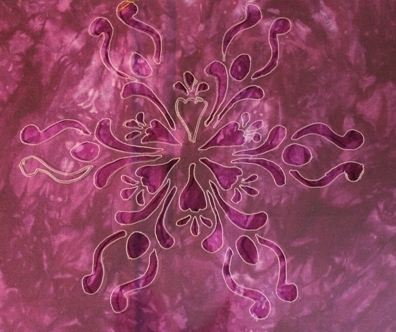 After I'm done the machine stitching, I will embellish this one with embroidery and beads. For today I got it sandwiched and backed since I like to do thread painting on my pieces, I also line it with a pieced of stiff interfacing. 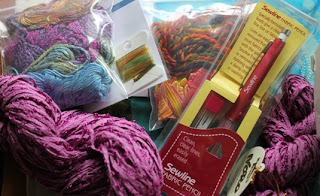 I'm looking forward to some sewing time this weekend. Have a good one! Happy Mother's Day! I couldn't wait to get back to the stencils and the discharge paste this morning but unfortunately today's results were less spectacular than Tuesday's. I got the second stencil cut last night and I did fix up the little piece I missed on the first one. Also, I fixed all the little bits that were missing on Tuesday's pieces, so that's good at least. 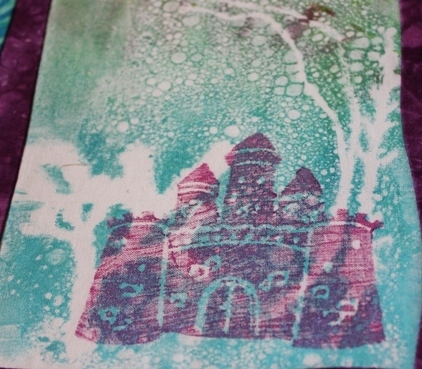 I had a go with the second stencil but the results are hard to see. Yesterday I was afraid I may have ironed too much before rinsing out the fabric but those ones were good. 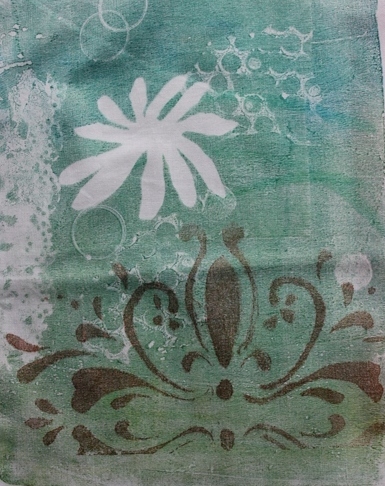 When I rinsed the ones I stenciled today, the results were rather ghostly as you can see below. I'm going to try again another day and see if the ironing time was the problem. I also wanted to try the stencils with some printing on the Gelli. I'm pretty happy with the results although the color is not showing perfect here. I hope the fold mark will eventually iron out. The green one was even less color accurate. I always have a hard time to get greens to photograph right. They end up looking too brown. 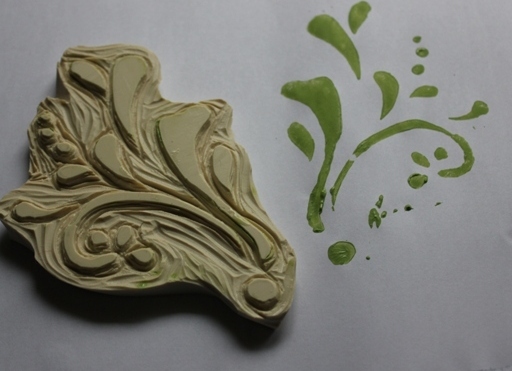 Wanting to get as much use from the stencils as I can, last night I tried my hand at carving a stamp for the first time. 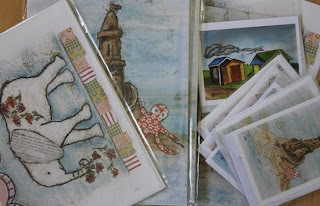 I use lots of stamps in my work, but I've always used craft foam which I cut and mount onto Plexiglass. I tried it out with paint to see what parts I need to clean up. 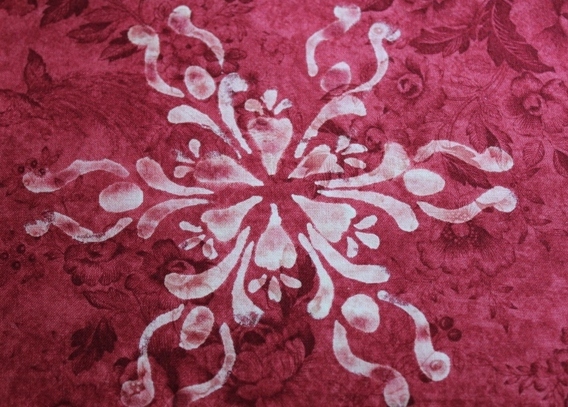 Luckily, it doesn't have to be perfect since I'll be stamping on fabric and then stitching over it. 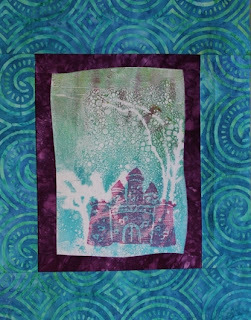 I am itching to do more printing and to get to my sewing machine, but my body is telling me to take a break, and so I will go make some tea and stretch out with a book. I ran over to Staples this morning and picked up two sheets of overhead projector Mylar. Boy that stuff is expensive! And I didn't want to get a bunch until I tested it. Turns out it is perfect! I think even stencil material might be too thick for me. It is a little hard on the hand and wrist tracing with the heat tool, but with the thinner plastic sheets, it just glides and cuts in one simple pass of the tool. Here you see the same stencil I tried yesterday cut with the overhead plastic--much easier to get details. Then, I couldn't wait to try it out. I happened to find a spray can of Elmer's glue, advertized for use on stencils; it's amazing what I can find in my closet! 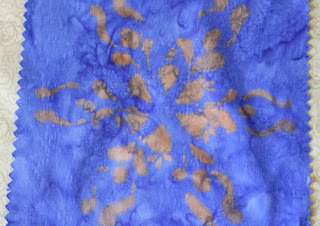 After spraying a fine coat of spray on the back of the stencil, I dabbed at it with a rag to take off any globs and to leave it just tacky. 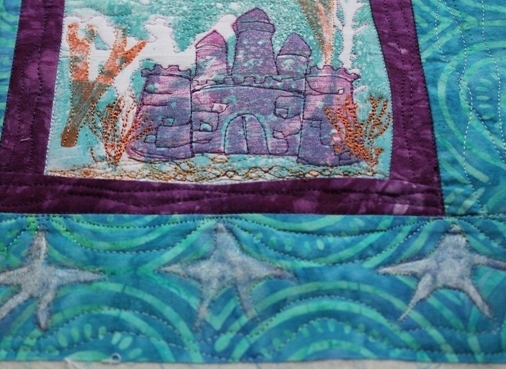 The bit of glue stays there and is just tacky enough, to have a better connection with the fabric thus resulting in better lines. I tried a stencil brush, but found the paste which is jelly like, works best with a sponge brush. Here you see the vague impression of the paste applied to a commercial fabric. This is what it looks like before ironing. I tried it on another commercial print. I don't mind any irregularities, they will even out with stitching applied but can you spot the mistake? I've managed to miss getting the plastic out of one spot spot so it didn't discharge. It will be easy when I do the next bunch to go back and fix it. Here it is on a Bali. Did you spot the missing piece? Tell you what, the first person to comment with the right answer, I will send them a finished piece. The next step will be to cut the second design and try it out. Then I will be ready to carry it further--perhaps I'll make a foam stamp all or part of the design to use on the Gelli plate. I might even send it to be made into a silkscreen. One design can be used for lots of fun! I could say that I accomplished something today. I feel like I didn't but it was definitely a learning experience. Firstly, I only had a bit of time because Monday is my cleaning day. It was sunny also and I felt the need to get outside. This afternoon, I set up my stencil cutter which I've barely used and got prepared to cut. In the picture you can see how I set it up. (Well, now that I look at it, you can't really see the layers.) There is the cardboard on bottom, then the paper pattern, the glass, and finally the piece of plastic. All this is taped down so nothing shifts. I realized quite soon that the plastic I was using was too thick but I finished anyway because I was dying to try it out! It was definitely too think to dab the discharge paste through and the effect is blurry which doesn't really bother me too much as I didn't want it too defined. I will run to Staples tomorrow to look for mylar to try agian.There are no stores here that would carry stencil material. Oh, and I was quite surprised by the color after discharging. I do remember now that I read somewhere the color you get after discharging can be a surprise and it was! I don't mind the color though, I was jsut expecting white. This is all a very complicated way to make a piece of fabric to try my freee motion quilting on. 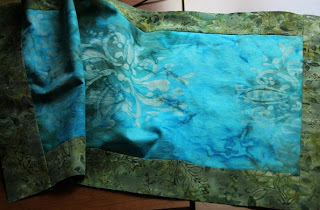 It would have been so much easier to use a piece of plain fabric but that wouldn't be my way, LOL! The other thing I did today was to package up some of my mixed media prints and cards. I do have a couple in my Etsy shop but I need these for the shop downtown where I plan to put my things in June.